England complete their tour of the United Arab Emirates on Monday looking to seal a 3-0 whitewash in the Twenty20 series against Pakistan in Sharjah. Having lost the Test series 2-0, England have fared much better in the limited overs matches, winning the one-day series 3-1 and the first two T20s. 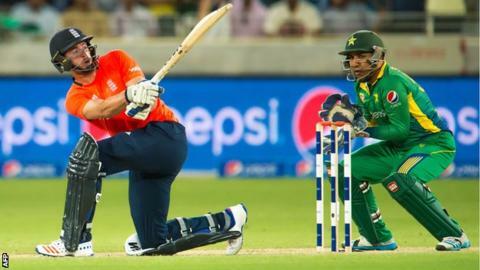 James Vince, who made 41 and 38 in his first two T20 internationals, told BBC Sport: "It has been a good start. "It's nice guys that are waiting in the wings are able to perform as well." The Hampshire right-hander was the top scorer in last season's domestic T20 Blast, scoring 710 runs at an average of 59 in 16 matches, with five fifties and a top score of 107 not out. Having had to bide his time waiting for an England chance, the 24-year-old added: "With only one Twenty20 against New Zealand and Australia last summer there hasn't been a huge amount of opportunity, but to come out here and get given a go was really pleasing. "The whole intensity and atmosphere is a step up from county cricket." Vince and Kent's Sam Billings have both impressed during this series and the Hampshire skipper is hoping he can secure a place in England's squad for the ICC World Twenty20, which begins in India on 11 March. "That would be a great thing to be involved in, fingers crossed that I can carry on contributing and help England to win some games," he said. Meanwhile, Pakistan, currently fourth in the International Cricket Council's T20 team rankings compared to England's sixth, are under orders to improve their fitness levels ahead of next year's tournament. Assistant coach Mushtaq Ahmed said of their latest defeat, by three runs on Friday: "The basics were not done by our players. We have to take some responsibility. "We have skilled players but we are maybe lacking in fitness and fielding, in today's game you need fitness." Despite that, Pakistan opted not to train at the Sharjah Cricket Stadium before the last match of the series. England made four changes for the second game, and may opt to ring the changes again so that most or all of their 15-strong squad play at least two of the three games. They also did not hold a conventional practice session on the eve of their final fixture, preferring instead to play football through one hour of morning training at Dubai Sport City. England (possible): Jason Roy, James Vince, Joe Root, Eoin Morgan (capt), Moeen Ali, Jos Buttler (wk), Sam Billings, Chris Woakes, Adil Rashid, Liam Plunkett, Reece Topley. Pakistan (possible): Rafatullah Mohmand, Ahmed Shehzad, Mohammad Hafeez, Shoaib Malik, Umar Akmal, Sarfraz Ahmed (wk), Shahid Afridi (capt), Aamer Yamin, Anwar Ali, Sohail Tanvir, Wahab Riaz.